Above: A high speed ferry leaving the Dockyards. 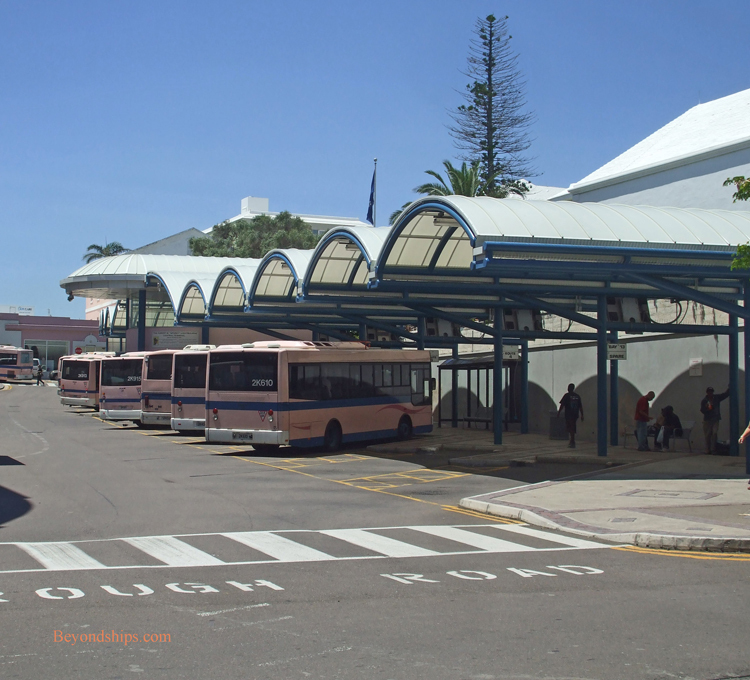 Above: The bus station in Hamilton. Below: A bus driving along Front Street. Above: A horse carriage ride in the Dockyards. 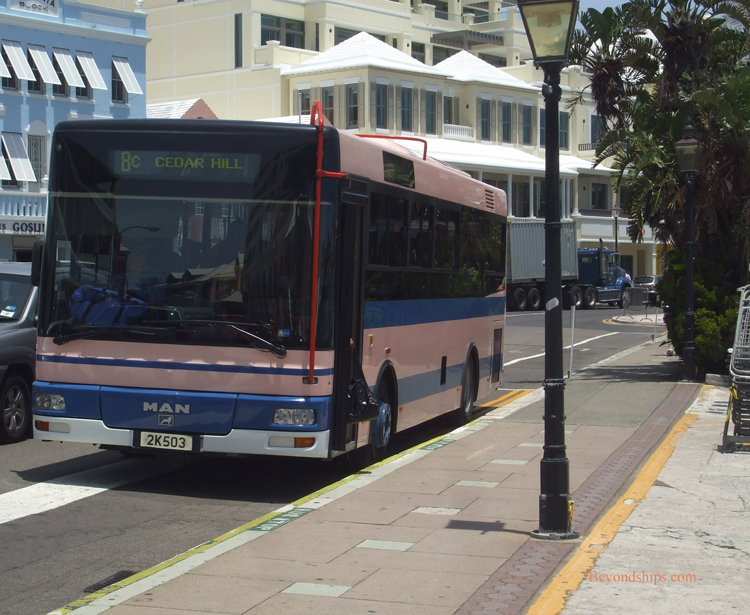 Bermuda has a good public transportation system. 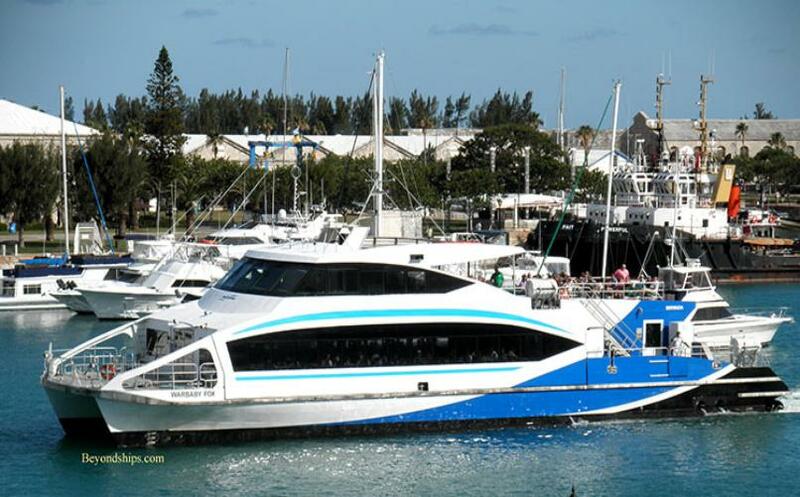 Most cruise ship passengers opt to take the ferry service that runs between the Royal Naval Dockyard, Hamilton and St. George. The ferries include high speed catamarans that pass islands with modern mansions and other interesting sights. The ferries are not expensive. However, the most convenient way of traveling on them is to purchase a transportation pass. Bermuda sells day passes and multi-day passes that are good for as many rides on the ferries as you like. They are also good on the public buses. As a result, you can travel all over Bermuda relatively cheaply. They can be purchased at the Hamilton Ferry and Bus Terminals, Visitor Information Centres, sub-post offices, hotels and guest houses. They are also available at several locations in the Dockyards. The ferries and buses ferries accept tokens and passes. They also accept cash but you must have the exact fare. In addition, the cash fare is more than the cost of a token. The regularly scheduled buses go to almost everywhere on the islands that a visitor would find of interest. Bus stops are marked by pink and blue poles. A pink pole indicates that the bus is heading toward Hamilton. The blue poles indicate that the bus is going away from Hamilton. As with the ferries, the fares are reasonable. Because the buses must follow the roads, which are often narrow and windy, and contend with traffic, they do take longer to go from say the Dockyards to Hamilton or to St. George. However, they do go to more places than the ferries (e.g. the South Shore beaches). 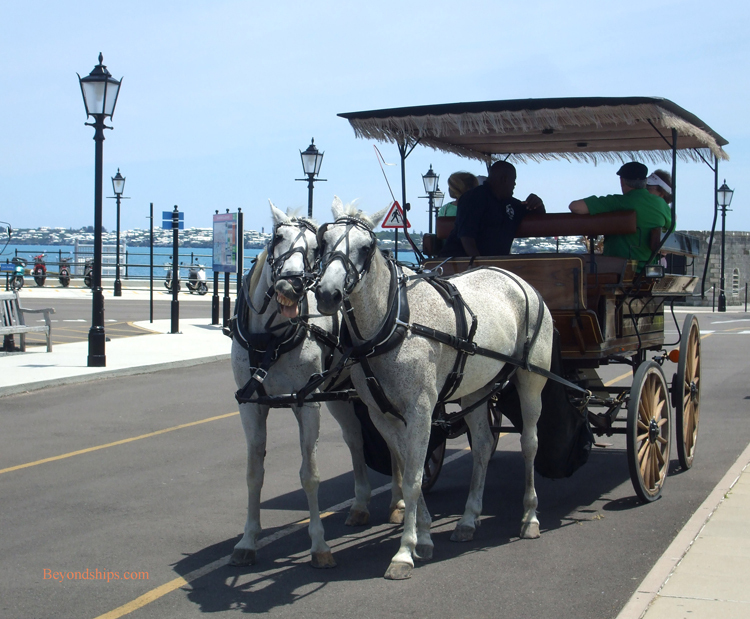 Taxis in Bermuda are regulated and are metered. The fares are greater for groups of five or more passengers and for trips during the period midnight to 6 a.m. 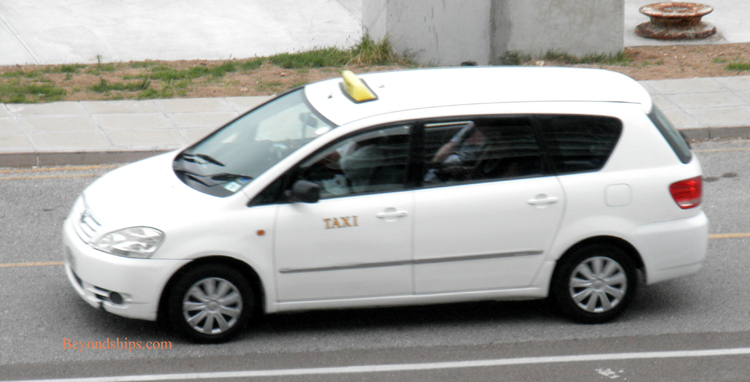 There are usually taxis waiting for passengers by the ships in the Dockyard. Mini-buses provide shared ride shuttles between certain points such as between Dockyards and Horseshoe Bay. The fare is more than the public buses but in the case of Horseshoe Bay the shuttle takes you directly to the beach. It should also be kept in mind when crossing streets and walking around Bermuda that Bermuda follows the British system of driving, not the American system. Thus, cars, scooters, and buses drive on the left.